In the late 90s, as Rare was following up their success with Nintendo's Donkey Kong, they decided to create their own cute mascot character. Well, after Banjo Kazooie, their second cute mascot character. They ended up with Conker, an adorable squirrel. Conker was due to appear in a game called Conker's Quest, which was essentially a Mario 64 clone, only with a squirrel instead of a plumber. That game then had its name changed to Twelve Tales: Conker 64. It was paraded around at E3, shown off in a few gaming mags, and then...disappeared. You can see some original footage below. It would re-emerge months later as something entirely different. 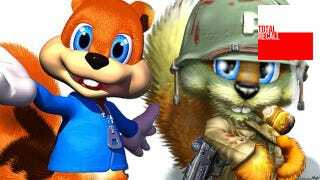 The game we now know as Conker's Bad Fur Day. Gone was the cuteness, replaced with obscene humour and over-the-top violence. It was one hell of a turnaround. So why the change? The character's creator, Chris Seavor, has a great interview up over on Gamikia, in which he explains that it was a crowded marketplace - Conkers was up against not only Mario but Rare's own Banjo Kazooie - more than anything else which led to the switch. And the tone the title eventually settled on? "The trick with any new game when you're trying to pitch it, and this applies across the board, whether you're doing a FPS, MMO whatever is : What does this game do that's different to its competitors? Humour, toilet or otherwise, was ours." And would be for many years to come, as Conker went from Nintendo 64 to Xbox, with a rather strange and terrifying pit-stop on the Game Boy along the way.